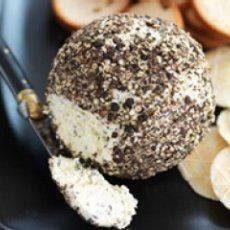 Celebrate National Cheese Ball Day, With This Sweet Mocha Cheese Ball! In a medium bowl, beat together cream cheese and butter until smooth. Mix in confectioners' sugar, brown sugar and vanilla. Cover, and chill in the refrigerator for 2 hours. Mix ground coffee and chocolate together. Roll the cheese ball in mixture before serving. Serve with graham crackers.